Swing era jazz is the perfect accompaniment to a lively party. The tunes are from the big band era of the 1930s and 40s. Think Great Gatsby, Art Deco and jive dancing. Ideal for weddings, corporate functions, birthday parties and receptions, swing jazz bands can really add something to your event. Let’s party like it’s 1939. Rockin’ in Rhythm – Named after a famous Duke Ellington tune, this eight-piece band is the largest on our books. Recreating the big band sound for a smaller budget is what they do best. 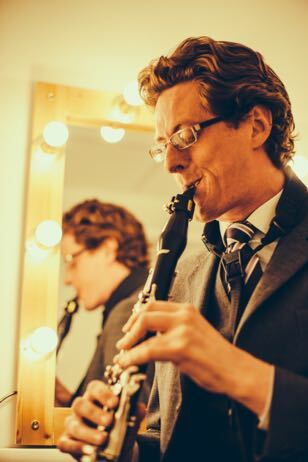 Duncan Hemstock – Australian sax/clarinettist Duncan has various configurations to offer. His speciality is most definitely swing jazz – he sounds like Benny Goodman on clarinet, and Lester Young on sax. Sara Oschlag Quartet – Sara’s quartet specialises in the swing jazz repertoire, playing tunes from the era with great attention to detail. Jive and lindyhop schools have hired this band many times. 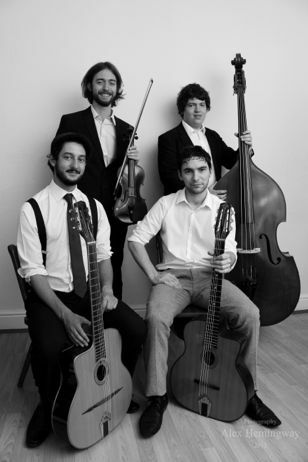 The Matt Holborn Quartet – Violinist Matt leads his own gypsy swing jazz quartet. The tunes are from the swing jazz era, the twist being they’re played in the classic French gypsy style. Our entire roster of bands is available to browse here. There are a few things you need to consider before you select the perfect swing jazz band for your party or event. First of all, the size of the venue needs to be taken into consideration. You don’t want an eight piece band playing in a cozy nook that only holds a few people, alternatively, a solo artist in a big venue might get lost in the crowd. The other thing you need to think about, of course, is your budget. An 8 piece swing jazz band is going to cost more than a trio of musicians, not only for the people but also the transport of all their equipment. Once you’ve got those things straight, then browse the list of artists on the Jazz Agency pages and see who takes your fancy. Contact us with the details of your event and we’ll take it from there. Hiring a swing jazz band is as simple as that!